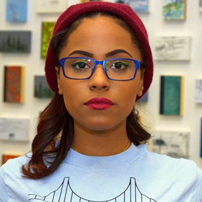 Jayde Tynes is Canadian Born and more importantly is unapologetically Scotian; meaning she embraces and incorporates her African Nova Scotian culture in everything that she does. Her family ties cover many historic black communities across Nova Scotia,Canada such as Weymouth Falls, North Preston, and Lucasville to name a few. Her passions for life and learning are in the areas of social justice, social equity, and internationalism. She has been organizing, and participating in community development initiatives, and social justice activism within her African Nova Scotian communities for over 9 years while branching out further into areas of climate justice for the past 3 years. She was most recently the Diversity & Outreach Programming Coordinator with CKDU 88.1FM “Campus and Community Radio”, where her primary role was to build bridges between CKDU and various marginalized communities through storytelling. The role of that particular bridge is to provide a safe passageway for voices from underserved communities to the wider provincial community. Her post secondary degree focused on her passion for internationalism by way of collective leadership and engagement. Over the past three years she has had multiple opportunities to elevate her community advocacy and organizing knowledge through travel. She recently envisioned and launched a community project called The Bridging Bus, which provided 12 men and women of colour with the opportunity to travel to the US and experience various forms of activism from Black Live Matter DC and CAPSOC in Baltimore, Maryland. Through her desire to learn and grow within her passions, she has been fortunate to have been a Canadian Student Ambassador to the USA; tour Northern China, visiting various religious and historic sites; study international relations at Universidad de La Habana, in Havana, Cuba; and attend the United Nations Climate Change Summit (COP21) in Paris, France. These opportunities have resulted in expanding her motivations for innovative community development, and have also furthered her understanding of borderless socioeconomic landscapes. She is currently producing a podcast titled My Blackness, My Truth. Which will uncover and conceptualized the varied and intersectional experiences within black identity across the diaspora.